The Quick Search Items command is used to add, modify, or delete quick search strings. From the Search menu choose Quick Search Items... The Setup dialog box opens. Use the controls in the Quick Search Items tab to add, modify, or delete quick search strings. You can define up to nine quick search strings. These strings will be displayed at the bottom of the Search menu in the main window. If you are satisfied with the definitions you made, click the OK button to save the results and update the Search menu list. Otherwise, click the Cancel button to cancel your changes. To search for a specific string you defined, select the appropriate menu item (1 through 9) from the Search menu. If that item is preceded with an “f”, the search will be done on the whole file (as if the Whole file option was selected in the Find and Replace... dialog); if it is preceded with an “i”, the search will be done only on the notes index list (as if the Index only option was selected in the Find and Replace... dialog). 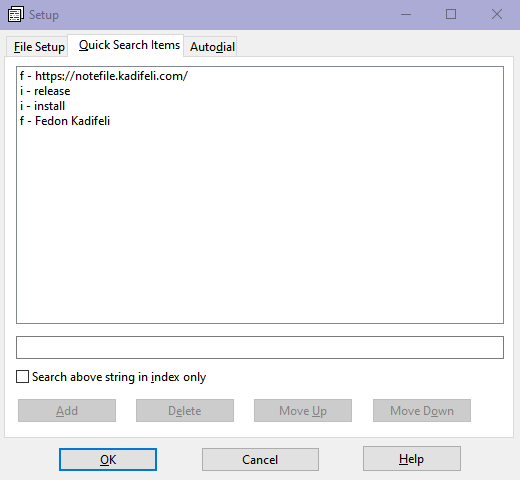 In previous versions of NOTEFILE (i.e., older versions of ADDRFILE), Quick Search Items were stored in the Windows Registry. Starting with version 1.14, they were also stored in the currently open file. However, NOTEFILE versions 2.00 and above never store Quick Search Items in Registry; they are stored only in the NTF file, so you may specify different Quick Search Items for each NTF notes file you have.